Mendihuaca Caribbean Resort has 148 villas decorated in a charming and living Colombian style with an unforgettable touch of the Caribe. All villas has exterior view, cable TV, air conditioned, limited kitchen and safe security box. The Complex has spa, swimming pool, solarium, fitness center, restaurant, mini-market, private beach, children playground, air conditioned, transport service included, sauna and Turkish bath. Mendihuaca Caribbean Resort has a superb location facing the beach close to Tayrona National Park and Sierra Nevada de Santa Marta, one of the best points of the Colombian Caribe. 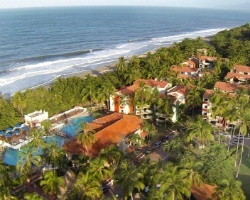 Enjoy a paradisiac beachfront Resort in Santa Marta Colombia. Rare resale opportunity! Buyer may receive a title fee credit, inquire today!